Gold locations and how you pinpoint them are discussed in the pages relating to gold locations - gold fields of WA and Old Gold Mines in WA. 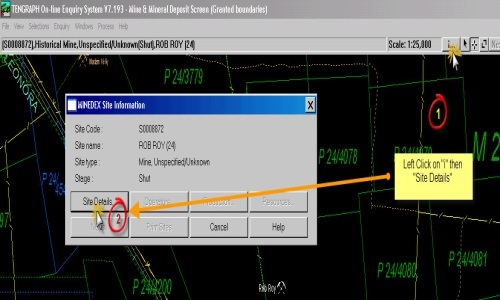 It is essential for you to have access to Tengraph Online which is a very powerful software tool provided by the Department of Mines and Petroleum in WA. We have taken the liberty on this page to assume that you have access to Tengraph online! .... If you dont we have written a free ebook to easily help you through the learning curve to set up and use Tengraph. Download the Easy to Use Tengraph Guide here. 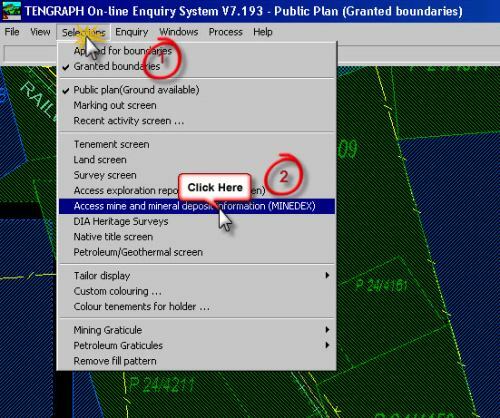 Access to the Tengraph system is essential for a number of reasons and one of those is that you can find out where gold fields and old gold mines of WA are. If you want to know more reasons to use this incredibly powerful and essential system link to the page about Tengraph and its uses Why Use Tengraph. How DO You Use Tengraph To Find Gold Locations Such as Old Gold Mines and Gold Fields in WA? This is covered completely in the Free Downloadable EBook Tengraph Easy to Use Guide in Section 5.12 and 5.13 but here is a brief overview of the steps you need to take to find Abandoned Gold Mines. Just Want to Find Out How To Find Abandoned Gold Mines? Then download this Free Ebook showing how to Find Old Gold Mines Using Tengraph Online. Please also be aware of the Disclaimers and Warnings on the Deparment of Mining and Petroleum Tengraph Online system about Abandoned Mine Sites and old gold mines. This is a very powerful tool that can show you where gold was found before and mined. This knowledge will help you to understand where it has been found in the past which will lead you to where it can be found in the future. First - Login in to Tengraph Enquiry Screen. If you dont have access or dont know how to download and use Tengraph then Download Free Easy to Use Tengraph Guide here. After you login to Tengraph and have the enquiry screen up and running. 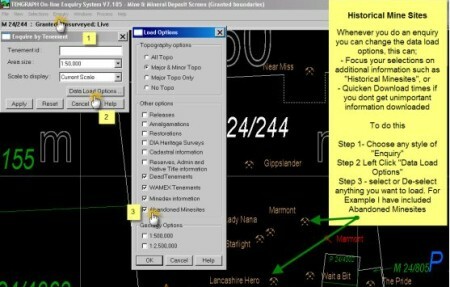 Step 3 - Make sure you Tick Wamex Tenements, Minedex Information and ABANDONED Minesites on the "Data Load" options. These will provide your specific gold locations! Step 4 - Left click the "Selections" Box in the Top menu and on the drop down menu select "Access Mine and Mineral Deposit Information (MINEDEX)"
Historical Minesites are included on the Tengraph screen by a crossed Mining Pick Symbol in a orange colour. Step 5 - Select "Enquiry" by left clicking on the menu bar. 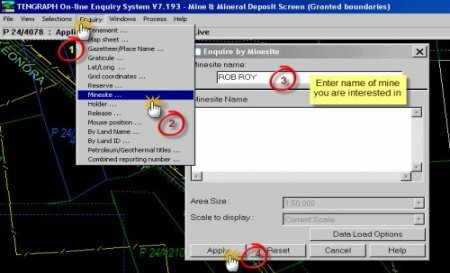 On the Popdown menu Click on "Minesite"
Type in the name of the mine you are interested in e.g on this Screen "Rob Roy" has been selected. You will notice that now the crossed mining pick symbol colour for "Rob Roy" has been changed to a white colour. 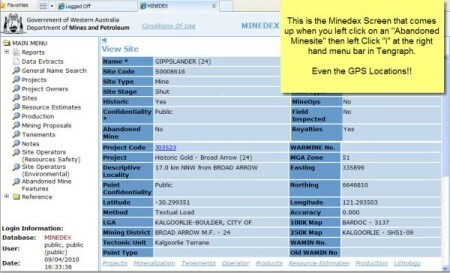 Step 6 - Click on the "i" symbol at the top right hand of the Tengraph screen and the Minedex Site Information box comes up. Click on "Site Details" and the "Minedex" screen will then come up which includes the GPS Location of the historical mine and a huge amount of data. Pretty Interesting and valuable information that can lead you directly to places where you might find gold. ... Free Ebook showing how to Find Old Gold Mines Using Tengraph Online. Make sure you use the power of Tengraph to find old gold mines, in other pages of the website we will explain how PATTERNS can lead you to new GOLD finds. One of those pattern searches relates to research around and between localities of Old Gold Mines.